Direct Export is the easiest way to add references to your account. View our list of export instructions by database. Your references will be automatically placed in the "Last Imported" folder, unless you designate another destination. Be sure that popup blockers are turned off or that you allow individual popups to open from the database vendor. Watch for RefWorks windows that may open / already are open in other windows or tabs. When off-campus, some direct exports may not function properly. Instead, try saving the references to a file and importing them manually. Manually exporting references from a database and then importing them to your RefWorks account takes a few extra steps -- but it is still much easier than typing out a long list of citations. 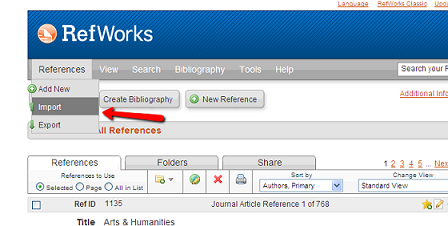 If direct export to RefWorks is not available, you will save your references to a file. The format of the file can be .txt, .ris, or another specified in our instructions. Navigate to References > Import. Select the Import Filter / Data Source and Database as indicated in our instructions. Browse to Select the Text file that you saved. Choose the folder where you would like to send the references (they will also be placed in the Last Imported folder). Be sure to follow the instructions and save the file in the correct format. Remember the name of the file and where you saved it.